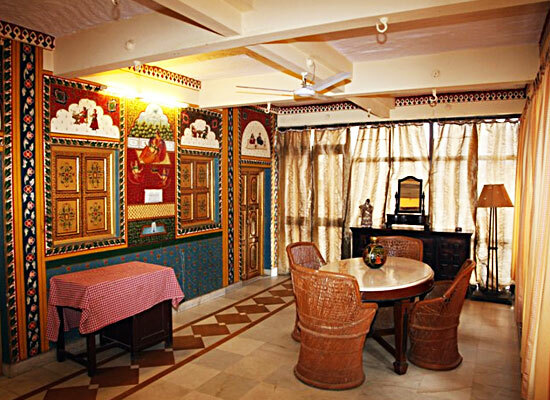 "One of the leading heritage mansions of Jodhpur, Krishna Prakash Heritage Haveli is known to be a treasure house of well-preserved paintings of the royalty. 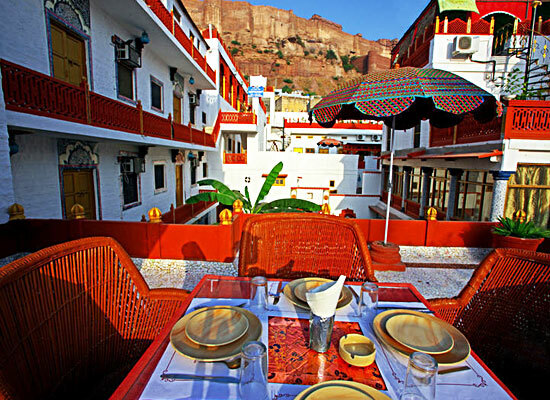 Placed at the foot of the mighty Mehrangarh fort, this property has been elegantly restored while adding modern comforts for the visiting guests, clubbed with flawless hospitality services. The exteriors of this mansion are equally regal as the interiors. The delicate carvings on the exterior gel well with the interior Marwari charm. The spacious rooms are elegantly appointed and the food at the on-site restaurant is superb. Krishna Prakash Heritage Haveli was commissioned by Late Lala Ram Chandra Mathur, Superintendent of Police, Marwar State way back in 1902. It later on became the residence of Late Shri Harish Chandra Mathur, Home Minister, Marwar State & Member of Indian Parliament. The property, now a heritage hotel is known to be a treasure house of some wonderful ancient paintings. It is a fine specimen of the royalty of the Marwari in those times. Krishna Prakash Heritage Haveli owns 28 stylish, spacious and well-equipped rooms, and suites with royal décor and contemporary conveniences. 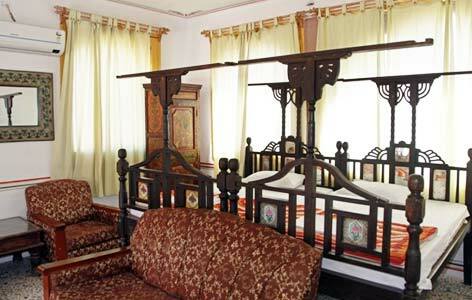 Vintage fixtures, antique artworks, huge family portraits on the walls, have been enhanced with various room amenities. While in your room, savor wonderful views of Umaid Bhawan Palace, and Mehrangarh Fort. The attached European style bathrooms are clean and come with round the clock running hot and cold water and complimentary toiletries. Air-conditioning, cable Television, study desks, daily housekeeping, huge king-size beds and room service are the other facilities. 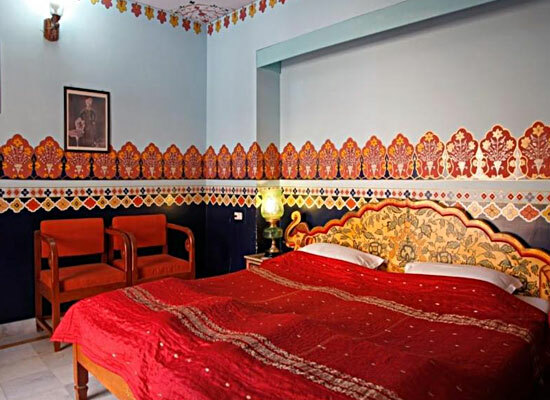 Hotel Krishna Prakash Heritage Haveli Jodhpur has four different restaurants in its premises which specialize in delectable preparations of Rajasthani and Marwari dishes. 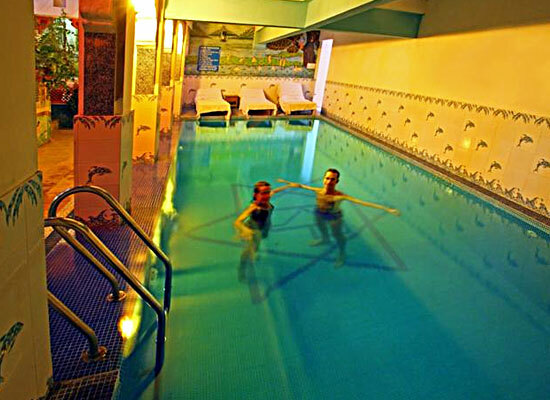 The hotel also offers Continental cuisines and open air barbeque meals. The hotel authorities arrange for a cultural bash every evening to make the dining experience a truly memorable one. Jodhpur is a wonderful city where you will get everything - class, culture and ethnicity. The generous splashes of blue lakes and the forts and palaces remind you of the long lost historical grandeur of the land, related to the noble Brahmins and the customary traditions of this tribe of fierce yet chivalric warriors.